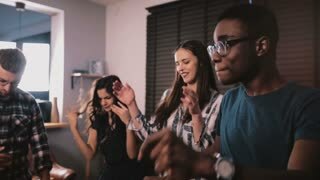 Happy African American employees doing fun ethnic dance at office party, celebrating business achievement slow motion. Two African American business people doing a fun dance together at casual fun office celebration party slow motion. Two professional dancers doing a Latin American dance and having fun at a holiday celebration event in the street.